Anthropologist Ales Hrdlicka and human skull are on stamp with face value of 1,80 KCS. "Hrdlička was interested in the origin of the human being. He was a critic of hominid evolution as well as the Asia hypothesis, as he claimed there was little evidence to go on for those theories. He dismissed finds such as the Ramapithecus which were labeled as hominids by most scientists, instead believing that they were nothing more than fossil apes, unrelated to human ancestry. [A1] One of the stamps from "Scientific and Cultural Institutions" that celebrate 50th anniversary of University of Brno shows ammonite at the bottom left corner. The ammonite of Clambites hypselus specie from Jurassic period. This is a small specie with size of 10cm - 15cm about. 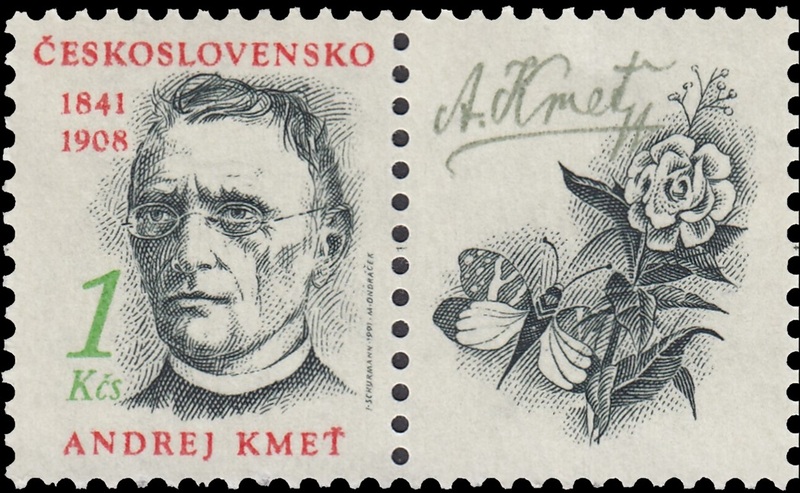 [A2] One of the stamps (the first on the image above) shows Andrej Kmeť. [R4] More information about Andrej Kmeť is on Wikipedia.